As organizations move increasingly toward a customer-obsessed operating model, digitizing all business functions becomes critical. Once manual processes have been digitized, they offer a starting point for your organization to extend and exploit. 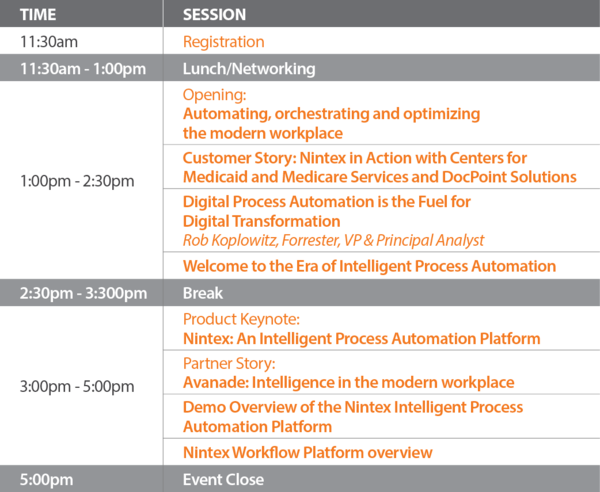 See how data, artificial intelligence, and machine learning can add intelligence to your process automation — and learn first-hand how the Nintex Workflow Platform is evolving to meet the needs of the modern workplace. Join us at our Nintex World Tour Washington DC event to learn how organizations like the Centers for Medicaid and Medicare Services are using Nintex to digitally transform their companies, automate sophisticated processes, and free up their employees to be more strategic, creative, and innovative so they can remain competitive in today’s changing business world. Special guest Rob Koplowitz, VP, Principal Analyst of Forrester will discuss why Digital Process Automation (DPA) will become a critical part of digital transformation.